Jharkhand Police Sub Inspector (Daroga) preliminary Exam was conducted in 33 shifts from 25.08.2017 to 06.09.2017. 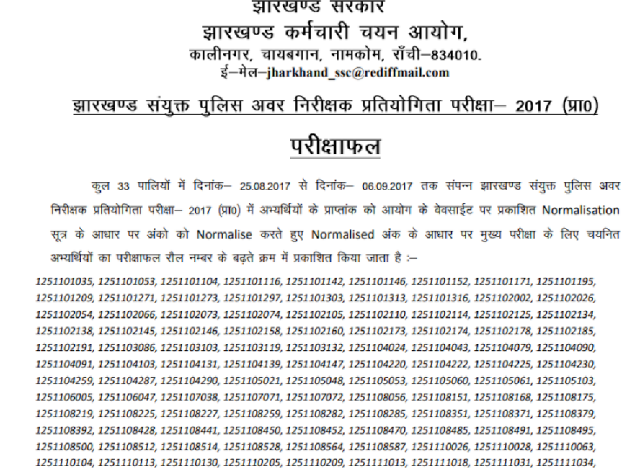 The result for preliminary exam of Jharkhand Police Sub Inspector is declared which you can download from the link provided below. Mains Exam will be held on 17.11.2017, a separate notice regarding Jharkhand Sub Inspector mains exam will soon be issued.